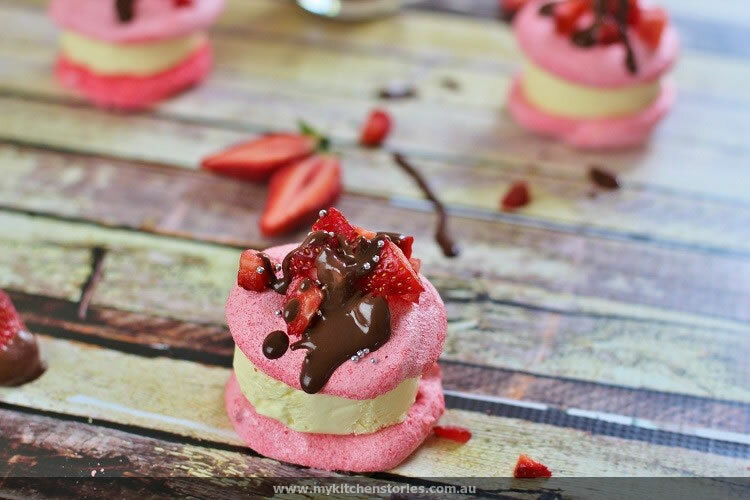 When strawberries are cheap and the weather is warm I like to make these Strawberry Jelly Meringues with no churn Vanilla Ice cream. They make the perfect Ice cream sandwich. Serve them to a crowd . It’s a completely make ahead dessert and perfect for Barbeques and outdoor times because they are hand held. So here is a recipe that you can tuck away for a summer weekend. 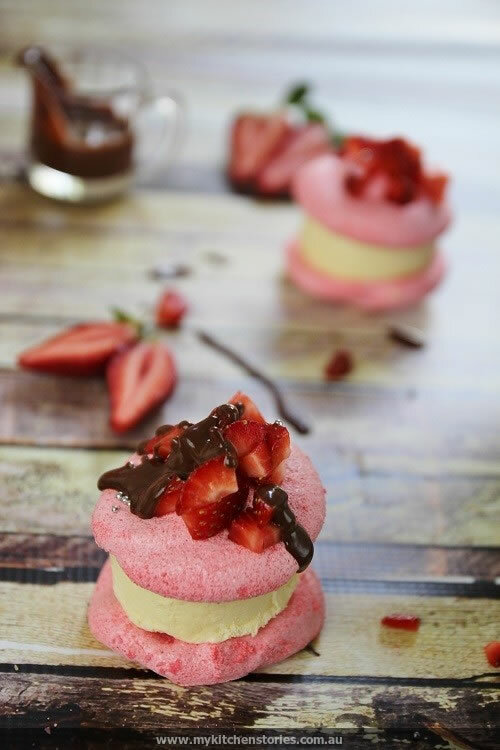 The meringue will surprise you, it is quite versitile and tastes a bit like a cheats version of freeze dried strawberries. The delicious Vanilla Semi freddo or ice cream is made without a machine. make it, freeze it then go back and cut out the rounds and refreeze for serving. all ready to go in a flash. Using a clean bowl, on a stand mixer, beat the egg whites till soft peak. Gradually add the sugar mixture a bit at a time letting the sugar dissolve between each addition until the mixture is glossy and firm like pink shaving foam. Prepare a baking tray with parchment paper. Spoon into a piping bag and pipe into individual circles keeping even and flat. I draw a circle onto the paper so that I make a perfect circle. Bake at 120 degrees for about 1 1/2 hours. (check by touching, they should be firm but not quite finished) Turn off the oven and leave till cool. Meanwhile , put the sugar split vanilla pod and the water into a small pot and melt. Let the mixture come to the boil without reducing. Remove the vanilla and gradually add the syrup to the eggs while beating. Keep beating till the eggs are cool. The mixture will be glossy and light . Fold the eggs 1/2 at a time gradually into the cream. 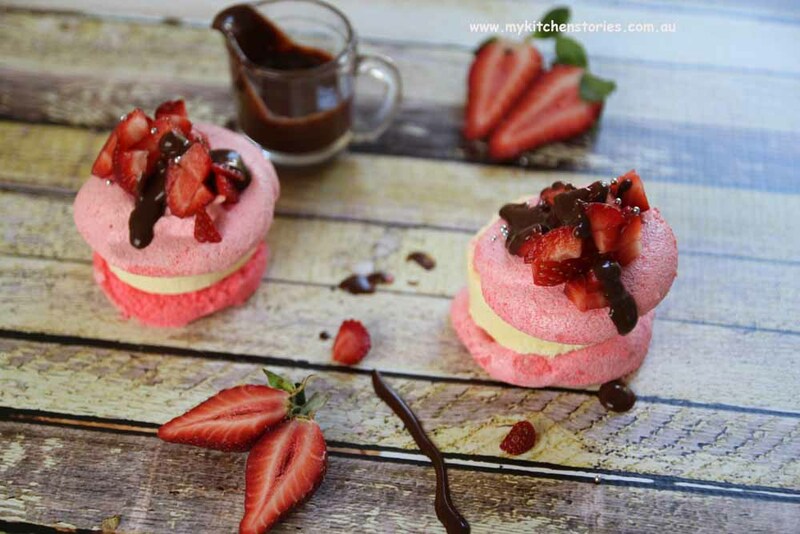 Tip the ice cream onto a bench on a piece of parchment and cut out rounds with a round cutter and refreeze as you go or Release from the muffin tin (sit the base on a warm cloth and run a hot knife around the diameter before turning out. You can make the little rounds ahead of time and refreeze till you need them. Aww shucks Tania you’re so sweet! I’m glad I’m not the only one obsessed with strawberries. I was just thinking today I’m going to buy a few kg and freeze them. This looks like a lovely way to use a few. Thanks for joining the hop! I really just have one word for these – wow! Kari @ bite-sized thoughts recently posted..Reflections and departures – the U.S.A.
Love it! I found 1KG of strawberries for $4 at Aldi! I know that probably means pennies for the farmers but I couldn’t resist a good deal. Yes I agree it makes me think that too. All of the desserts look delectable! 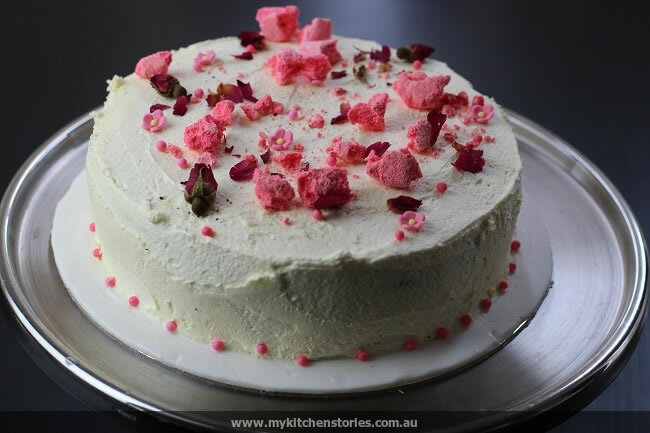 I love the idea of using jelly crystals in your meringue, I’d have never thought to do that myself – genius! We’re still waiting on local strawberries here in SA, they aren’t too far away though, it’s my favourite time of year. Do you make jam? I love your cakes too, the Oreo one is particularly drool-worthy. Omg! Love all of it Tan. Crazy good. Amazing! 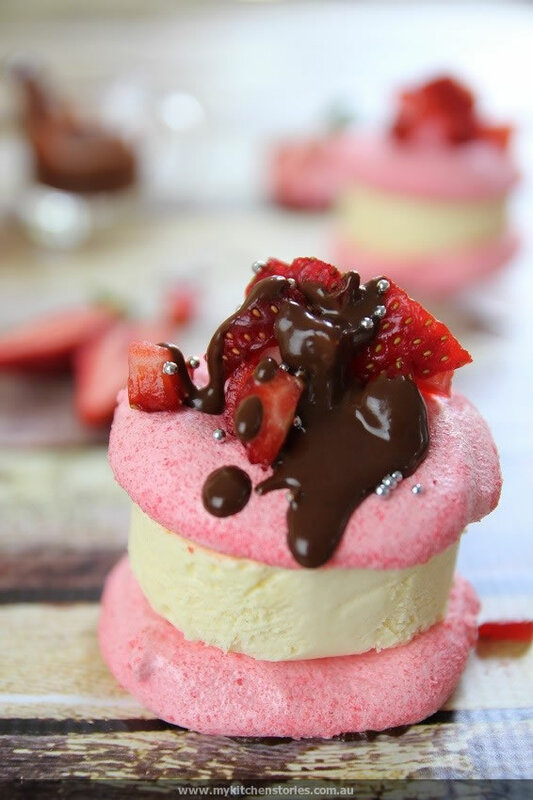 I love the strawberry meringue sandwiched semifreddo! 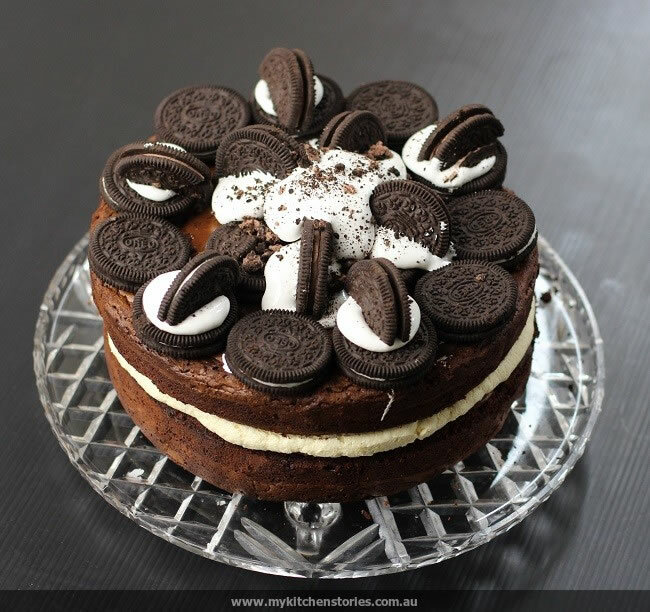 The oreo cake looks splendid, Tania. 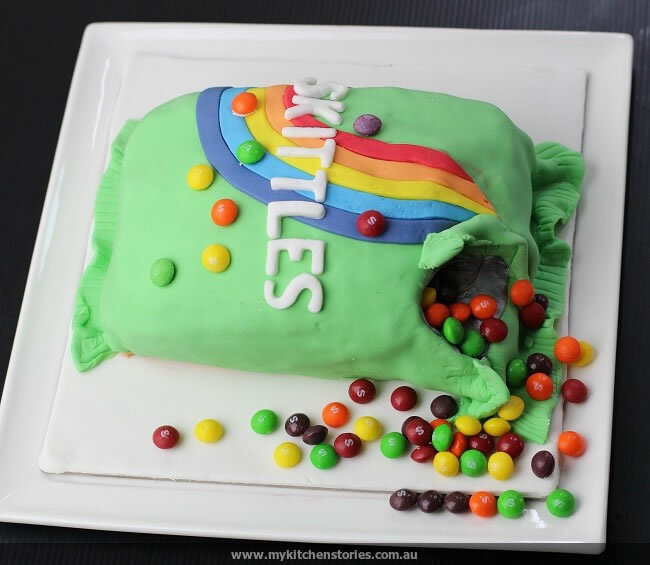 I’m in love with the skittles cake. 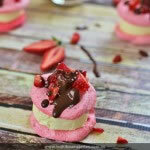 I love that your meringue is so easy – I can’t believe jelly crystals in meringue works so well! Oh yes the strawberries! Only problem is I can’t eat them fast enough and they go off so quickly! These ice-cream sandwiches make me excited for summer! Deepa@onesmallpot recently posted..Is it just me or……..
Wow this just heralds summer 🙂 It’s hard not to stock up on strawberries at the moment isn’t it? Love the colour of your meringue! Love freeze dried strawberries! I’m wonderfully tempted by this recipe! G’day Tania! Your photos are stunning, really caught me ye, true! Your now have my mouth-watering as want to try one right now too!